Internships can be really helpful for the start of your career or learning about a business. Where to find the best internship for you? Talen Trail might be a good place to start. 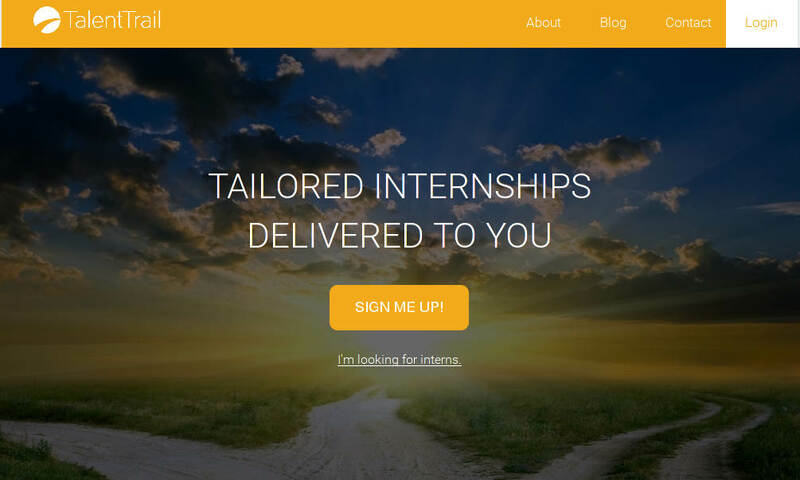 This brand new college start up allows companies publish branded and focused landing pages for finding the best interns they need. The site has a large database with candidates, which are automatically filtered by work experience, skills, knowledge, culture and many other factors. This way, businesses are provided with a short list with the most suitable people for their internship. This makes the process smooth and easy not only for employers, but also ensures that every internship candidate will be offered to the company that is the best match for her/his needs. The site helps both of the sides make the best choice they can. This really cool idea was turned into business by two young students from The University of Southern California. The start up was founded in 2015 in Los Angeles by the 20 years old Sydney Liu and Ryan Choi, who is 22. They financed it by a little of their own money, and $13 000 from winning some start up competitions like The New Venture Seed Competition of The University of Southern California. The company is just taking off, it has just been noticed by some big sharks. It the companies using the service grow with each single day, as the numbers of the registered students looking for a start in their career. The site has recently launched a mobile app, so everyone with a smart phone can access its services. The future looks promising for Talent Trail, we’ll be watching its development with interest. Companies like !Yahoo and TechCrunch are starting to use the service and this is just the beginning.